Rosamund Pike has won the "Best Newcomer" award at the 2003 Empire Awards for her role as Miranda Frost in "Die Another Day". She was competing against Cillian Murphy "28 Days Later", Parminder Nagra "Bend It Like Beckham", Neil Marshall "Dog Soldiers"and Martin Compston "Sweet Sixteen" for the prestigious award. Previous winners have included Orlando Bloom "The Lord Of The Rings: The Fellowship Of The Ring", Jamie Bell "Billy Elliot" and Carrie-Anne Moss "The Matrix". "Thanks, Empire, thanks. Empire's always been supportive on Bond, I guess and I had a great time making the movie." "Obviously people liked it so thanks a lot. I really appreciate it." Rosamund Pike will next play Conny de Bathe Brandon in "Castle of Lies"alongside James Caan and Luke Mably. The film is to be shot in New Zealand by Yvonne Mackay and is due for release later this year. 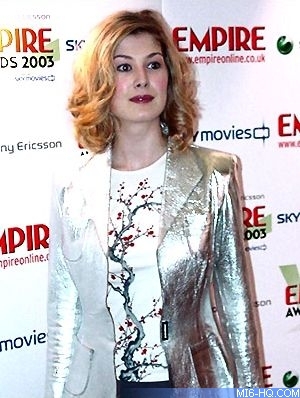 Left & Above: Rosamund Pike at the Empire Awards 2003.